Boyacá is located in the Andean Region in central Colombia, over the Cordillera Oriental mountain range and covers a total area of 23,189 km². The territory of present-day Boyacá was during the Pre-Columbian time the domain of the Muisca indigenous peoples. The Muisca under the chiefdom of the zaque of Hunza lived mainly by agriculture and mining gold and emeralds. The first European to discover the area was the Spaniard Gonzalo Jiménez de Quesada who conquered the northern Muisca living in the area led by last zaque Aquiminzaque and distributed the land in encomiendas and forced the indigenous people to work for him. Boyacá is known as “The Land of Freedom” because this region was the scene of a series of battles which led to Colombia’s independence from Spain. 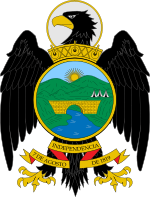 The first one took place on 25 July 1819 in the Pantano de Vargas and the final and decisive battle known as the Battle of Boyacá was fought on 7 August 1819 at Puente de Boyacá. Colombian – Boyacá represents 120 unrelated individuals who were born in Boyacá and were sampled in 2003 by the Universidad Nacional de Colombia, Bogotá. Source publication: Allele frequencies for 13 STR’s from two Columbian populations: Bogotá and Boyacá, FSI, 2003, p83-85.